Luckily for people, some plants are able to make do without perfectly clean water, leaving more good water for drinking. One strategy is to use treated wastewater, containing salt leftover from the cleaning process, to water large areas of turf grass. These areas include athletic fields and golf courses. Golf courses alone use approximately 750 billion gallons of water annually in arid regions. 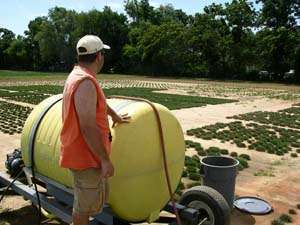 In selecting for strains of perennial rye grass with high saline tolerance, individual plants are irrigated with increasingly higher levels of saline water. Survivors move on to the next round. Poor performers go into the trash.